Nirvana: The Spread of Buddhism Through Asia, by Jeremy Horner, is a photographic journey tracing the origins of Buddhism and following its evolutionary paths from its birthplace at Bodh Gaya, India to northeast Asia, along the Silk Road through China, down to Sri Lanka, and across to southeast Asia. From its origins at Bodh Gaya on the plains of northern India, we travel up into the Himalaya of Ladakh, where Buddhism thrived and split in the five different sects. Our journey takes us to Nepal, historically a receptive home for Buddhism, to Tibet in Exile in Dharamshala, and to Sikkim and Bhutan paying homage to the sacred sites of Mahayana Buddhism along the way. We venture along the silk route into the mountainous region of Xinjiang in China, and to the largest monastery in the Buddhist world at Labrang in Gansu Province, home to the Yellow Hat sect. We visit the Longman Caves and the legendary Shaolin Monastery, with its extraordinary Kung Fu monks, before eventually embarking for Korea and Japan to trace Tantric Buddhism. There we sample the tranquility of Zen temples and the fresh mountain and sea air of the most sacred pilgrim sites. We follow the story of how the once precarious belief emerged as Theravada Buddhism and found a haven in Sri Lanka before progressing eastwards to Burma, and on into southeast Asia, as far as central Java. We explore the exquisite temples of Luang Prabang in Laos, Angkor Wat in Cambodia, and Sukhothai in Thailand where Buddhist art reached a certain zenith. 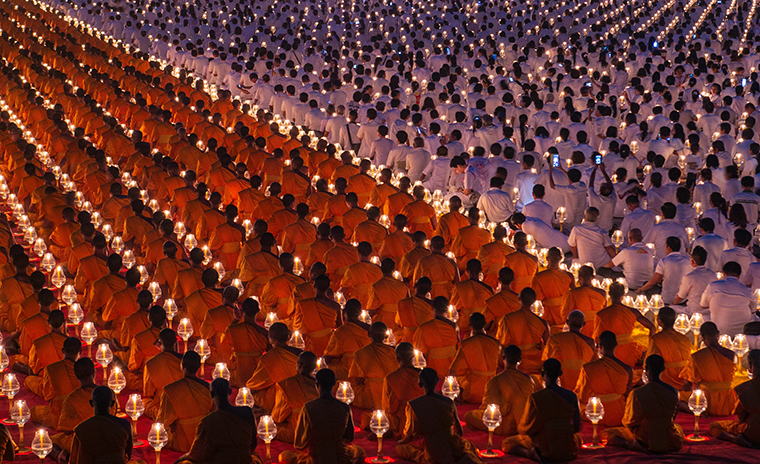 This is a journey of spiritual as well as visual enlightenment, as we meet Theravada Buddhist pilgrims along the way. Finally we traverse the Tibetan plateau to reach the fabled capital of Lhasa, with its spiritual center of the Jokhang Temple and the iconic Potala Palace, the abandoned home of HH the Dalai Lama. Maps with reference to the photographs will guide you along the routes. The illuminating text by Denis Gray provides an authoritative perspective of Buddhism in 21st century Asia and assists in navigating the reader through the book’s journey.